Budapest has a host of bridges for people to walk along and absorb the air of the city. Elisabeth Bridge is one such example of a really beautiful bridge. Running over the enchanting Danube, it connects the Buda side of the city to the Pest side of the city. It is comparatively new and is the third newest bridge of Budapest. The name of Elisabeth Bridge comes from Elisabeth of Bavaria who was the empress of Austria- Hungary when they had made pacts to tie up. She was assassinated in the year 1898 and the bridge is made in her memory. 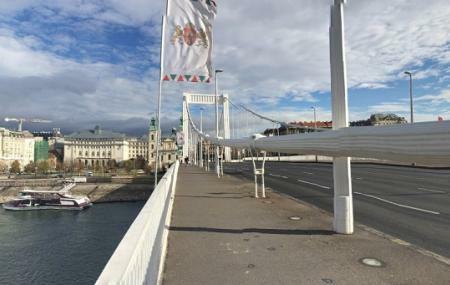 It is also one of the narrowest bridges in the city and spans only up to 290 meters as it is on the narrowest side of Danube. It connects the March 15 square to the Gellert Hill. You can visit the bridge any time of the day. How popular is Elisabeth Bridge? People normally club together Vaci Utca and Gellert Hill while planning their visit to Elisabeth Bridge. We both walked this bridge and saw it from the river cruise. Really a sight to see and a WONDERFUL story behind it. Who doesn’t e joy a good love story? Not the most extravagant of the bridges connecting Buda and Pest but lovely none the less. It seems second oldest bridge in Budapest after iconic chain bridge.It looks more beautiful during night when it is illuminated.Many events are planned on this bridge by blocking traffic on Sunday for few hours.You will see different colors of locks tagged on bridge by couples. One of the most beautiful bridges in Budapest. Recommended to take an evening boat ride for best pictures of this bridge. Among other historical Bridges of Budapest this one with a bit modern architecture and in plain white looks kind of cool.